On August 9, Bobbi Kristina and her boyfriend, Nick Gordon, honored Whitney Houston's 49th birthday by getting the late singer's initials tattooed on their wrists with four doves surrounding the letters WH. The 19-year-old Brown also tweeted voraciously about Whitney who passed away on February 11 the night before the Grammys 2012. Her body was found at the famed Beverly Hilton Hotel in Beverly Hills, California. One of Bobbi's social media shadings said about her late mother said, "Once it hits 12 am mommy it's your birthday & I am going2celebrate it2thee fullest! Bc YOU deserve it damn it, YOU deaerveNothingburtheBEST! 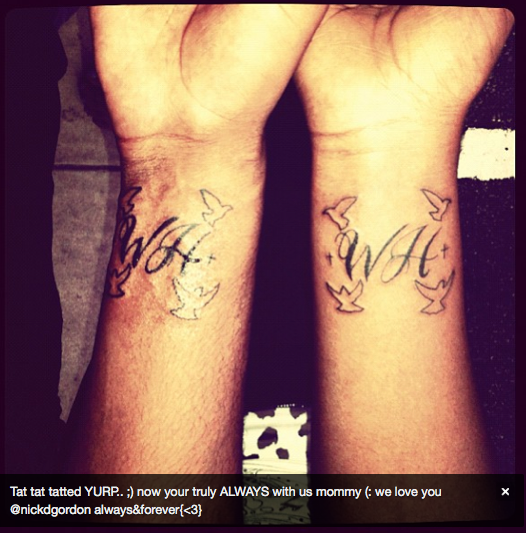 [sic]"
The young woman also talked about her trip to a tattoo parlor with boyfriend Nick Gordon where the pair got their matching tattoos. She mentioned in the tweet that this particular inking was being taped for her reality show so in the future everyone who wants to can watch as the teen and her partner undergo the sometimes painful process. Bobbi Kristina Brown also asked that Whitney Houston be a trending topic in honor of the much beloved singers 49th birthday. Ironicially, as of this writing, her mom's name is not trending but her daughter's name is.